I am writing this letter to you in the context of your comments during the recent election campaign against the lies and improprieties of Prime Minister Narendra Modi. This letter is to bring to your notice some more lies and fabricated cases indulged in by Modiʹs government, Maharashtra government of his own party and Maharashtra police. I would like you to openly state your position and opinion on these lies and cases also. As part of a large conspiracy hatched by the Central government, Maharashtra state government and Sangh Parivar, a false case called ʹBhima Koregaon violence caseʹ was fabricated and ten intellectuals along with my husband Varavara Rao are implicated in it. 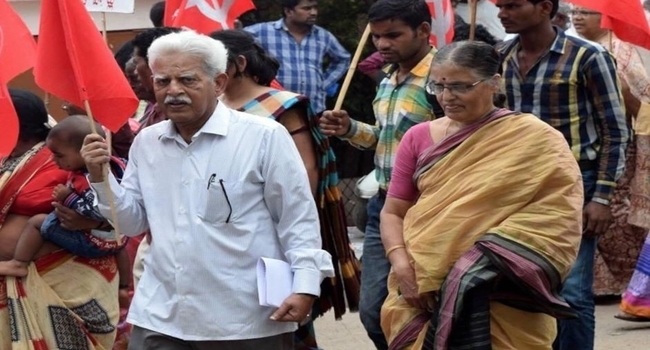 Varavara Rao has been imprisoned in Puneʹs Yerawada Central jail for the last five months in this case based on false allegations and fabricated evidence. I would like to remind you that in the past when Revolutionary Writersʹ Association was banned and Varavara Rao was kept in jail in similar illegal incarceration, as a minister in the Central cabinet you visited him in Chanchalguda jail on September 3, 2005, brushing aside the protocol objections raised by the then state government. A judgesʹ panel had struck down the ban on the organization three months later, but by the time you met him, the ban was in vogue. I hope you, as a person who set aside protocol and met him in jail then, would take a similar position when he is being subjected to similar atrocious incarceration now. Varavara Rao is a worthy child of Telangana. He has been expressing in favour of separate Telangana since 1968. He has been using his pen and voice for the sake of protecting the interests Telangana people for the last fifty years. He was one of the organizers of the seminar held by Telangana Graduates Association that paved the way for 1969 Jai Telangana agitation. The help and cooperation he rendered to the 1969 and 1972 movements as a poet, editor and public speaker are well known. Along with his PhD dissertation on Telangana novel, he penned hundreds of writings on Telangana issues. In the second phase of Telangana movement, from 1997 Warangal Declaration till now he has written a lot of poetry and essays and delivered hundreds of public speeches in favour of separate statehood movement. In this context, let me also remind you the opinions of Telangana doyens Kaloji and Prof K Jayashankar about Varavara Rao and their association with him. ʹOne who treats all those sufferers as his own and our own would certainly become a person of everybody…Varavar is a person of everybody and it is remarkable that he is our own. Personally for me it is a privilege that he is my own,ʹ said Kaloji. ʹVaravara Rao and I are friends for a long time. Though we have ideological differences, he is one of those I respect a lot. Like me, he is also straight in everything,ʹ said Jayashankar. If only they were alive today, both of them would have been in the forefront in condemning this illegal incarceration of Varavara Rao. I think it is the responsibility of Telangana society when a person, a poet, a writer and a public speaker who stood for the interests of Telangana people for so long and so much is subjected to the machinations of the police of a neighbouring state and imprisoned, to raise its voice against the imprisonment. As the head of Telangana government it becomes your duty also. Your responsibility grows much more since you are raising your voice against the falsifications of Modi and Sangh Parivar. In fact, imprisonments and restrictions are not new to Varavara Rao. In the last 45 years Andhra Pradesh police have foisted 25 false cases against him. In the last five years Telangana police also arrested him thrice in illegal manner. In the past cases against him all kinds of serious charges were leveled. But prosecution could not prove a single charge in a single case. Courts released Varavara Rao as innocent and not guilty after striking down 13 out of 25 cases. The same courts quashed three cases even before trial, finding there was no case at all. The remaining 9 cases were withdrawn by police themselves. Even though all the cases were struck down, he had to be in jail as an under-trial prisoner for seven years. The present case foisted by Pune police and another case foisted by Aheri police while he is in jail, are similarly fabricated, false cases. They cannot stand the scrutiny of courts. Bu in the meanwhile, Bharatiya Janata Party government hatched a conspiracy to keep him in jail illegally. It is inhuman and illegal to harass a 79-year old person who is not keeping good health like this. He will certainly attend the courts and participate in trial, as in all the earlier cases and hence he could be released immediately on bail. I request you to spell out your clear cut position on this case, taking into consideration his immense contributions to Telangana people, his health and age as well as the horrible manner in which both Maharashtra government and Modiʹs government are going ahead about the case. I think it is necessary that you pronounce your unequivocal stand on the illegal imprisonment of Varavara Rao to prove that your apparent opposition to Modi is real and you are sincere in that opposition.